Ok, THIS took me a while. I originally did this on SketchFu, so the quality might not be as good. Anyways, I'm proud of it, especially the hands. 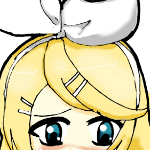 This is Rin Kagamine, one of my favorite Vocaloids. She's in the pose from Butterfly On Your Right Shoulder.